I love making things from scratch. It just tastes better, 99% of the time. There’s so much satisfaction in saying “I made it myself.” You always know exactly what went in it, and you can tailor it to suit your tastes. Fortunately, as I’d find out, tomato sauce can be much easier than bagels and sugar cookies. 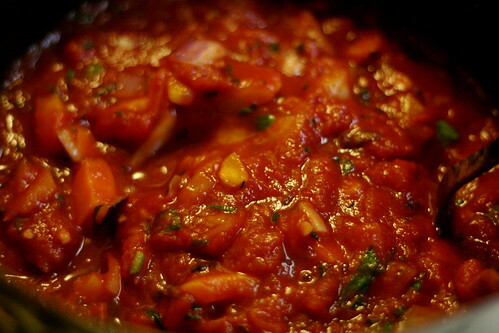 Nick, brave soul that he is, whipped this sauce together without knowing the Italian grandma rule. I just came home one night, and it was heating on the stove. He may not be Italian, and he’s definitely not a grandma, but it took a lot of will power not to just eat all the sauce, straight up. Both of us were spooning it right out of the pot. I’m sure he looked up several recipes online and then adapted them for his taste and our available ingredients, but I have no idea which ones he used. I’ll check with him and give credit where credit is due. 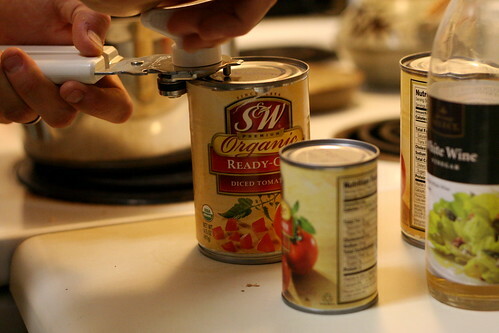 Start with two cans of diced tomatoes. 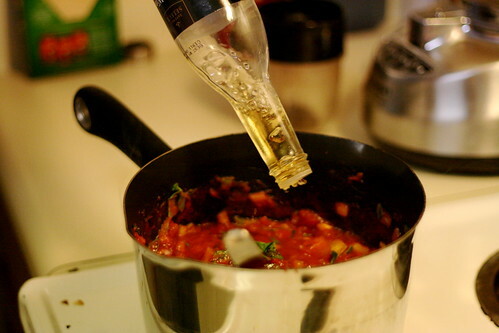 If you want to use seasoned tomatoes, that’s cool. 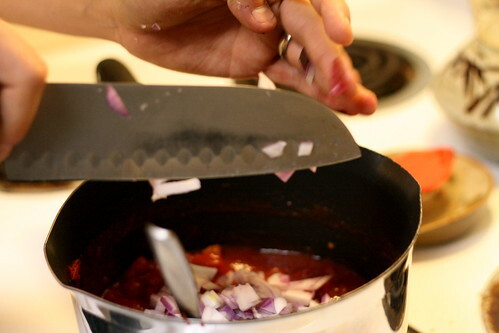 We buy these in bulk at Costco so that we can make a lot of sauce. 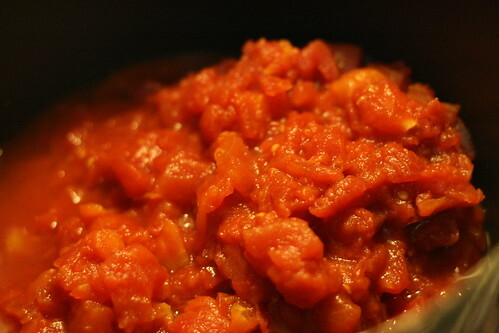 Throw ’em in a pot, and then add one small can of tomato paste. Add some diced onion. We like chunky sauce, so there’s about half an onion in there. Diced orange bell pepper. Ours were pretty sad and limp, but we were able to get about one whole pepper worth in the sauce. Here’s where the Italian part comes from. 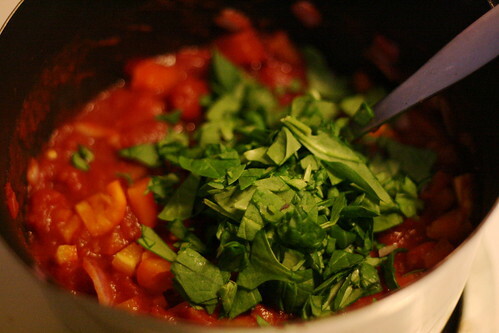 Fresh basil makes a huge difference in the flavor. If you’re in a pinch, you could definitely use dried basil–just know that you’re missing out, and try not to be too sad. We added 2 cloves of fresh garlic, but you can use more or less, depending on how Italian you are. We also added a large handful of fresh spinach, just for fun. We didn’t regret it. Give that a stir, and then add a few shakes (about 1 tablespoon) of white wine vinegar. Then a teaspoon of baking soda and a teaspoon of salt. When you add the baking soda, it will fizz and bubble a bit. I like watching this part, maybe even more than my son does. He’s five. I’m not. It’s ok. I was so busy watching the bubbles that I forgot to take a picture! I’m so fired. 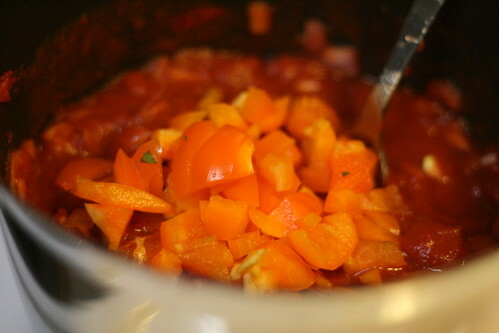 Give it another stir, and then just let it simmer for a little while until heated through completely. This sauce is really versatile. You can season it however you want, and we use it for all sorts of different things–pasta dishes, straight up spaghetti, chicken–we even put it in the food processor and used it as pizza sauce. 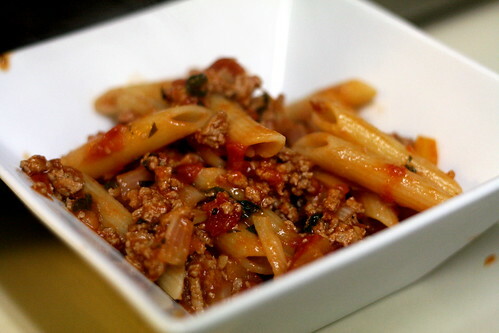 Waaaaay better than canned pizza sauce! It freezes really nicely, so you can make up a big batch and pull it out as you need it, and as the sauce hangs out, the flavors get stronger and more defined. So go get sauced! Then call your Italian grandmother and tell her all about it. Jo – that looks delicious! 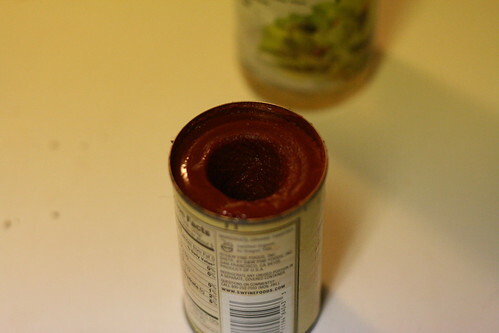 What does the baking soda do for the sauce? One of the best tips I learned was to add a little sugar to cut the acidity, but I haven’t heard of baking soda added before. I would love to know why it helps! Hi there! That would be great. What’s your group? Next Next post: So Many Cookies!